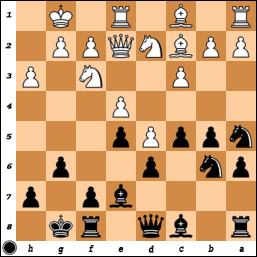 After 29.Bxe6 Qxh5+ (if Black recaptures on e6 right away, the f4-pawn falls) 30.Bh3! 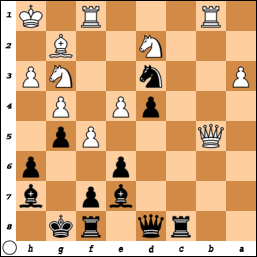 (not 30.Rh2 Qxf3 with check and then Black can take on e6) Qxh3+ 31.Rh2 Qe6 32.Nxf4 Qf6. Now I played 33.Kg2 Ng5 34.Rdh1 Re7 and sat down to figure out how to win the position. This turns out to be a little tricky, so returning the above diagram, maybe I should have played 29.Kg1 (threatening 30.Bxe6, as now there’s no check on h5) fxg3 30.Bxg3 with an advantage for White. Black’s pieces simply don’t have enough room to maneuver while White’s two bishops are slowly coming to life. 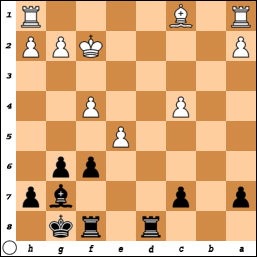 This looked quite good for White, as Black has no entry on the e-file while White can operate on the g- and h-files. One idea is 35.Rh5, for example, when White threatens 36.Rxg5! Qxg5 (the h-pawn is pinned so it can’t move) 37.Rh5 Qf6 38.Rf5, trapping the queen on f6. 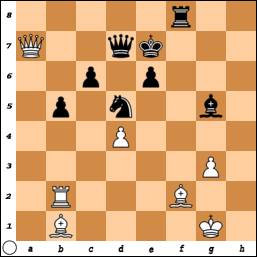 Unfortunately, when White plays Rh5, Black should play …Ne6, as the Nf4 no longer has the useful h5-square at its disposal. After the game, Haslinger (who was down to a minute at this point), admitted he hadn’t seen the queen-trap idea, but the prospect of him finding it and playing …Ne6, which at least equalizes immediately was too much for me to try it. 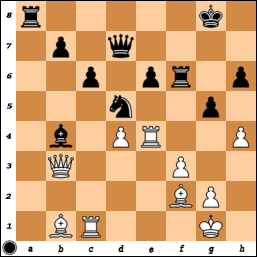 White has just played 22.Bc1-f4, saving his queen from being trapped by 22…Rb8. White is up a pawn, so if I just sit around, he’s going to consolidate that advantage. Thus, I lashed out with 22…g5!. It looks quite odd, but I really just want that bishop off the f4-square. If now 23.Be5?, f6 wins the bishop, since 24.Bxd4 Rb8 wins the queen instead. Or if 23.fxg6 fxg6 24.Bxh6, Rb8 traps the queen, while if 24.Be5, 24…Nc6 forces the win of two pieces for a rook – White can’t stop …Rxf3 and …Nxe5. 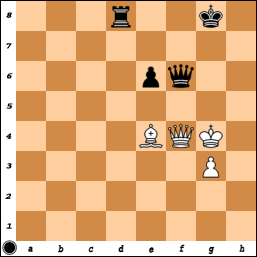 Therefore, he played 23.Bd2, and after 23…Nab3 24.Rab1? Nxd2 25.Nxd2, I played 25…Nxd3!. On second thought, maybe he thought that without the cricket references (you can see what those terms mean here, on Wikipedia). He was clearly happy with himself after an earlier b2-b4 idea that eventually netted him my b5-pawn (not by force), but the shock of …Nxd3 really threw him for a loop and he lost the thread of the game quite quickly. Instead of something like 26.Qxd3 Rc3 27.Qa3 Rxa3 28.Qc6 Rxg3 29.fxe6 Bg6 with a mess, he played 26.f6?! 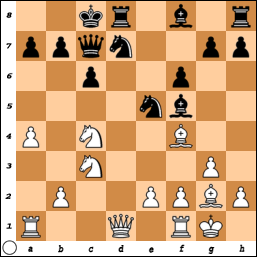 (opening the Bh7’s diagonal) Bd6 27.Qd3 Rc3 28.Qxd4 Rxg3. 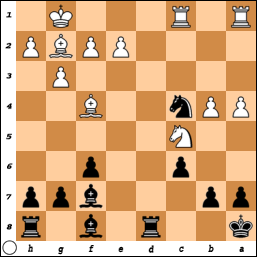 Black’s still not winning, but he continued to flail about with 29.Nf3 Bf4 30.Rfd1? Qa8! 31.Re1 Qxa3 and now Black is winning. I finished him off in a few more moves. I was a little surprised by his choice of this Slav variation, and I hadn’t looked at it before. 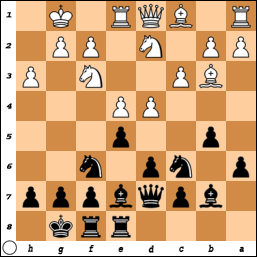 Black is threatening …Nc5, so I decided to get my queen off the d-file with 13.Qc1. After 13…Nc5, I played 14.Bxe5 fxe5 15.Qe3, hitting the e5-pawn. However, he continued on his merry way with 15…Nb3 16.Rad1 Bc5. I played 17.Qxe5 and offered a draw, which he accepted. As it turns out, this position had been played once before earlier this year (Avrukh-Hector, Politiken Cup 2009), and Hector went on to win a nice game. I offered the draw as I figured that despite my pawn plus, the endgame after 17…Qxe5 18.Nxe5 Rhe8 is easier for Black to play (I think Black is at least equal here), and on a couple hours of sleep, I wasn’t interested in playing to hold a draw if I could avoid it. While I do think I would have held the endgame, he accepted and saved me the trouble, partly because he said he was tired too for the morning game after the late night round the previous day! Thus, I finished with 6.5/9 (4 wins and 5 draws). That was good enough for 6th place on tiebreaks – GM Andrey Sumets took clear first with 7.5 points, followed by 3 players with 7 points. I’ve played a number of tournaments in Spain before, but this was by far the strongest one. In my 9 games, I played 6 GMs, 1 IM, and 1 FM, for an opponent’s average rating of 2462 FIDE (my performance rating was 2629 FIDE). The only real negative about the event was that most of the rounds were at 8:30 PM. With one game a day, that’s really too late in the day. I guess they wanted to give locals a chance to do their work and the visitors a chance to go around, but as a visitor without too much to do in the area, that was really too late in the day. It did allow me to get away with my sleep schedule though, so I can’t complain too much. My next tournament in Navalmoral de la Mata (a small town near Madrid) starts in a couple days. 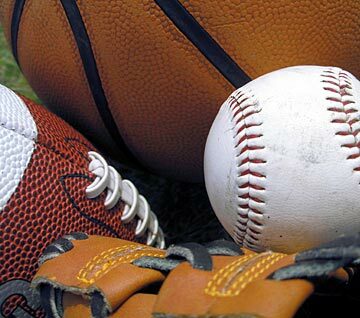 Unlike most European events, it’s on a 2-games-a-day schedule, so it will pass by pretty quickly. 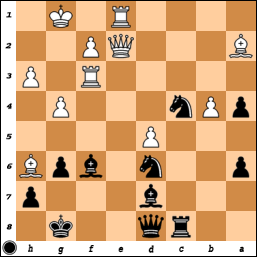 After my first 3 games (described here), I was sitting on 3 points and my reward was the black pieces against GM Anton Kovalyov (2601 FIDE). This was our third game in 5 months – I drew the first one as black in June before losing as white in August. I had a feeling he would play 5.b3 against the Semi-Slav (it was his first time doing so), partly because it suits his positional style and also because in the 2 games I have in the database against it, I lost to GMs Granda Zuniga and Vescovi. Neither loss was due to the opening – in fact, I was worse out of the opening and Granda but then outplayed him in the middlegame to reach a completely winning position, while against Vescovi, I equalized in the opening only to be outplayed in the middlegame. However, I had expected somebody at the Montreal International in August/September to try it out against me, so before that tournament, I had done some work on the line and I got to use that preparation here. I had met his 5.b3 system with a Stonewall setup and he decided to force an exchange of bishops on a3 which led to a queen exchange there as well. 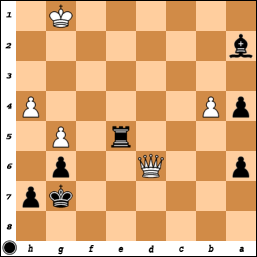 Black shouldn’t have too many troubles in this endgame, but he still should be a little careful to avoid drifting into a worse position. 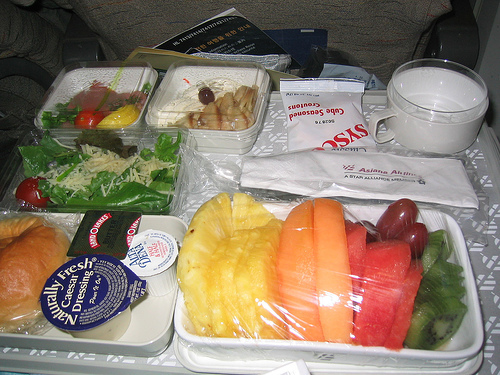 I played 15…Ba6 16.Ke2 c5, fighting for the center. 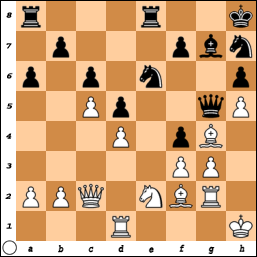 White can’t play 17.cxd5 yet because of 17…Bxd3+ 18.Kxd3 Nxf2+, picking up the rook on h1. After his 17.Rhc1 move, though, White can take on d5. 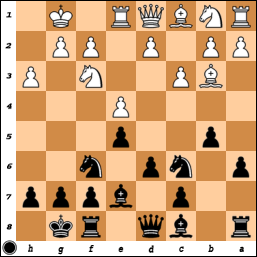 Pretending that Black passes, White will play 18.cxd5 Bxd3+ 19.Kxd3 exd5 (19…Nxf2+ 20.Ke2 isn’t much better) 20.Ke2, when Black has to worry about his pawns on d5 and c5 all the time. 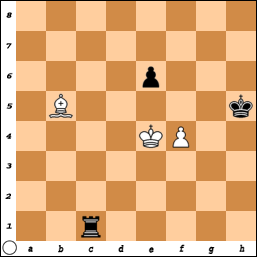 After a long think, I came up with the correct solution – after 17.Rhc1, I played 17…Nef6!. 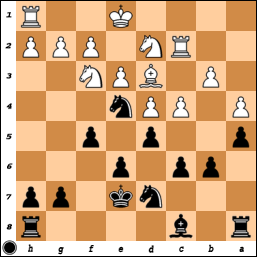 It might seem a bit odd to retreat Black’s nice knight, but now Black is ready to capture on d5 or c5 with a knight, keeping the files closed and Black’s pawns out of the White rooks’ line of fire. Funnily enough, it was this same knight move that helped me equalized against Vescovi, although the situation was quite different (I wanted to bring it back to d7 to fight a white knight on e5). After this, it wasn’t too difficult to hold the endgame even in time pressure (I ended up with 5 minutes to his 58 minutes!). In round 5, I had the white pieces against GM Tamaz Gelashvili (2610 FIDE, Georgia). He played an offbeat opening that I wasn’t so well prepared for (The Two Knight’s Tango: 1.d4 Nf6 2.c4 e6 3.Nf3 Nc6), and while I should have been better after the opening, I accidentally let him go after my dark-squared bishop with his knight. In order to save it, I had to do some funny stuff that cost me some time and he gradually outplayed me in the middlegame. I had lost/sacrificed the b4-pawn, thinking that with his bishop making the trip from g7 to take on b4, his kingside would be weakened and I’d be able to take advantage of that. The game continued 32…Bd2 33.Rd1 Bf4 34.g3 Bd6 35.hxg5 hxg5, and it was pretty much only now that I realized that on my planned 36.Rg4, he could play 36…Ra3 and grab my f3-pawn. After the check on g5, his king steps over to f8, as it can’t be hurt there. For some reason, I had only been counting on something like 36…Qg7, which fails to 37.f4. With that in mind, I played 47.Qa3+ b4 (47…Qd6 48.Qa7+ and it isn’t obvious how Black is going to make progress, while on 47…Kf7, I was planning 48.Qd3) 48.Rxb4!? Nxb4 49.Qxb4+ Kf7 50.Be4. With Black’s king being so exposed, I was hoping that I would be able to drum up enough counterplay for a perpetual. In the end, I did win the c6-pawn, but he got my d4-pawn and brought about an exchange of bishops. After a lot of maneuvering and posturing to try and gain time on the clock, Gelashvili finally decided that he wasn’t making any serious progress and went for the endgame. 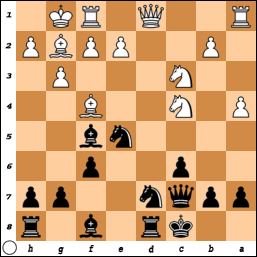 Black has just played 96…Rc3-c1, thinking he’s stopped 97.Bd7 (which would have won the e6-pawn). However, I played 97.Be2+ Kh4 (97…Kg6 would have admitted that the Kh5 journey was not making any progress) 98.f5! Re1 99.fxe6! Rxe2+ 100.Kf5. 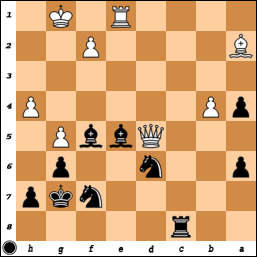 White only has a pawn for the rook, but the king on f5 shoulders Black’s king on h4, and Black can’t avoid a draw. The game ended 100…Kh5 101.Kf6 Kh6 102.e7 Kh7 103.Kf7 Rf2+ 104.Ke6 Re2+ 105.Kd7 Rxe7+ 106.Kxe7 with a draw. Phew! That was my longest game of the event and we finished at about 1:30 AM. 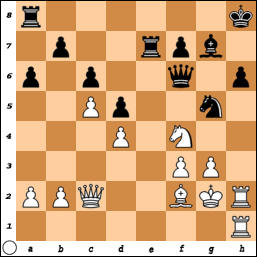 White’s problem here is his lack of development and exposed pawns on f4 and c4. Even though he’s up a pawn here, those problems will make sure that he can’t hang onto it. In fact, he might well end up down a pawn here! He didn’t play it quite correctly in my view, as he missed a resource of mine after 21.e6. Instead of that, I think 21.exf6 was correct, acquiescing to an equal position after 21…Bxf6 22.Rb1 Rd4!? (both 22…Rfe8 and 22…Rd3 are also interesting) 23.Be3 Rxc4 24.Rhc1 Rxc1 25.Rxc1 Be5 26.g3 Bd6 with equality. He can’t take the pawn on a7 because of …Ra8xa2+, but material is equal and he’s caught up in development. Instead of that, he played 21.e6, trying to hang onto his pawn. After 21…Rfe8 22.Re1 Rd4!, though, he realized that 23.c5 is met by 23…Bf8! when Black is on top! 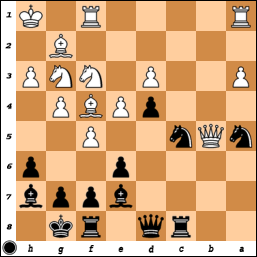 If the pawn advances on to c6, then Black can try either 24…Bc5 or 24…Rc4 with advantage. He decided to cut his losses with 23.Be3 Rxc4 24.f5 (the f-pawn was likely to be lost anyways, but this way he ruins my pawn structure) gxf5 25.Rec1 Rxc1 26.Rxc1 Rxe6 27.Rxc7 a6 and a draw was agreed in short order. 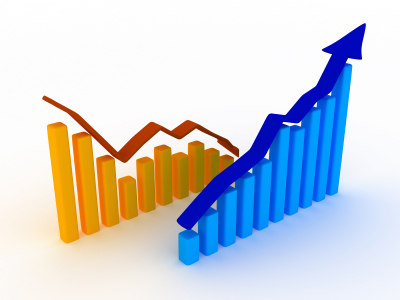 The a-pawns got liquidated when Black’s extra kingside pawn is good for nothing. So, after 3 straight wins, I had 3 straight draws (although none were without an interesting moment or two) and had 4.5/6. I’ll recap the last third of the event in a later post.